September 01, 2018 at 5:36 pm. 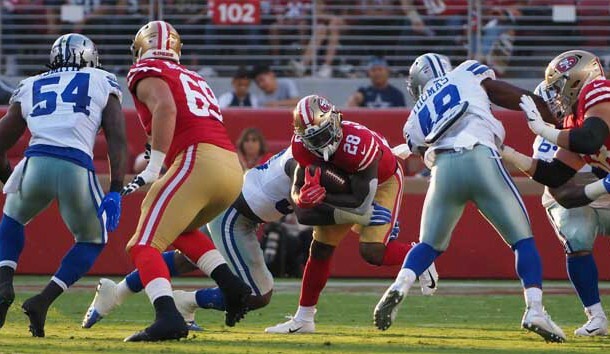 San Francisco 49ers running back Jerick McKinnon sustained a torn ACL, according to multiple sources, on the final play of practice Saturday and will be lost for the season. The injury was of the non-contact variety. McKinnon was to be the starter when San Francisco visits the Minnesota Vikings — McKinnon’s former team — in Week 1 on Sept. 9. McKinnon sustained a calf strain earlier in the preseason but was expected to be ready for the season opener versus Minnesota. The third-round pick by the Vikings in 2014 from Georgia Southern totaled 1,918 yards and 12 touchdowns (seven rushing) in four seasons in Minnesota. He signed a four-year, $30 million contract with San Francisco during the offseason. Matt Breida, who was cleared to return to practice Saturday after sustaining a shoulder injury, was listed second on the depth chart. He averaged 4.4 yards per 115 carries in his rookie season after going undrafted out of Georgia Southern. Alfred Morris and Raheem Mostert are also listed on the 49ers’ depth chart at running back. Morris began his career by gaining 3,962 yards and 28 touchdowns over his first three seasons with Washington but slumped to 1,541 yards and four TDs over his last three seasons with Washington (2015) and Dallas (2016-17). Mostert rushed for 36 yards over the last two seasons with San Francisco.